October 2015 is Breast Cancer Awareness month, so what better time to reinforce the love and support you have for family and friends suffering from the disease. 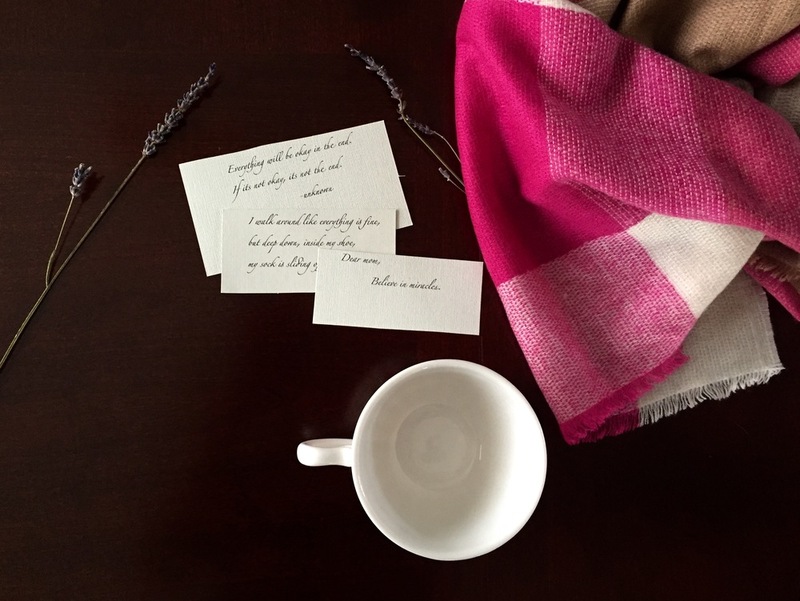 Encouragement for those battling cancer comes in all shapes and forms, but coming up with the right gesture or gift idea for someone who is sick can be a daunting task. Remaining positive, strong and hopeful is the key to overcoming all forms of illness, including breast cancer, making the best gifts those that stimulate happy memories and motivation to continue the fight. The most supportive and therefore effective gifts ideas that offer encouragement to our loved ones are those featuring a customized element and a personal touch. The Power. Peace. Pamper. gift box has been created specifically for the brave girls fighting breast cancer, but can be given for any battle against cancer. Focused on bringing peace and support with inspirational quotes, sayings and messages with a touch of beauty. During the month of October, The Gift Firm will donate one gift box to a Chicago area cancer treatment center for every ten gift boxes sold. We believe everyone should feel supported. All of our gift boxes are customizable and able to add a personal touch to make your friends and family feel extra special. The 'Life's Cherished Moments' gift box is a present that truly lets people know how much they are loved and the difference they have made to the lives of those around them. The delicately and elegantly decorated box houses an assortment of 30 or more letters, each lovingly composed by friends and family and artistically printed onto high quality, handmade paper. As the name of the gift set suggests, the letters can be used to reminisce about cherished memories that were made and shared together. Remembering special moments is a wonderfully encouraging way to show someone they are loved and to support them through the hard times. Thoughtful gift ideas such as the memory filled box are made better by the fact that they are not only enjoyed for a fleeting moment as they are being opened, but rather can be cherished and re-lived over and over again every time the heart-felt letters are read. The ornate box provides a beautiful and safe home for the letters, which can be kept forever and re-read whenever an extra boost of encouragement or hope is required. Sufferers of cancer inevitably find themselves on a rollercoaster of ups and downs, and when those downs occur, the personal letters filled with happy memories can make a huge difference to their state of mind and positivity. Another similar but alternative gift idea for moms, dads, partners, friends or any other loved one suffering from illness, is the 'A Year From Now' gift set. This beautifully thought out set include two blank sheets of fine, handcrafted paper with matching envelopes, encased within a stunning box. The paper provides the opportunity to write your hopes, dreams and wishes for the future, to be sealed within the envelopes and opened the following year. Two sheets of paper means they can be exchanged between loved ones or simply kept to remind the sufferer of their own feelings and wishes. Accompanying the decorative box is two tea lights to create intimate and peaceful lighting while writing or reading the letters, as well as a soft and comforting blanket. This Breast Cancer Awareness Month, why not show your loves one just how much they mean to you with a gift that will stay with them forever? As the years go by, continuing to think up useful and meaningful gifts ideas that will be both enjoyed and appreciated by our loved ones becomes harder and harder. The act of picking out the perfect gift for someone you care about deeply should be something of joy and pleasure rather than a time of stress and anxiety caused by that desire to get it just right. Whether gifting for a Christmas, special birthday, or even after the passing of a loved one, there is one particularly sentimental present that is sure to be a success, and that is the gift of shared memories. Sharing memories can be more than just casually reminiscing in conversation. In fact when combined with a beautifully decorated gift box and put into the written word, special memories can be kept, looked at and remembered forever more. Life's Cherished Memories Gift Box is an example of just that and offers a beautiful and thoughtful way of sharing those standout memories with your loved ones. Despite the boxes ornate and gorgeously decorated exterior, in the case of this creative gift idea, it is not what's on the outside, but those sacred memories stored on the inside that really count. can even provide prompts that will help to trigger the ideal memory to commit to paper. On receiving their personal Life's Cherished Memories Gift Box, emotions often run somewhat higher than with the standard present. This is one of the few gift ideas that will truly be appreciated and remembered for life. Recipients are filled with joy at being reminded of so many happy moments from their life, and giving such an extraordinary gift that provokes such emotion is a rare and joyful privilege in itself. The best part of this gift for loved ones is that it can be enjoyed over and over again by simply opening the box and reading through those cherished letters kept safe within. As gift ideas go, this one is particularly versatile and is ideal for a range of occasions including Mother's Day, Father's Day, Anniversaries, Birthday's or Valentines Day but it could of course simply be a spur of the moment gift for Mom or Dad to show them just how important they are to you. The box contains 30 letters providing plenty of opportunities to get your most cherished memories down on paper. Reading through the letters one by one is an incredible experience and one that makes this item the ultimate, once in a lifetime gift that will be a pleasure to receive and a true, true pleasure to give.